Many of us have relatives or know of someone who has been stricken with the debilitating Alzheimer’s disease. And most of us remember when President Ronald Reagan wrote a letter to the nation announcing he was stricken with it. Now, an Illinois police chief has been stricken with it at the relatively young age of 49. 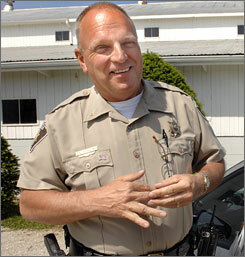 Spencer Johansen, Police Chief of Lexington, IL, announced he is in the early stages of the disease. And he started to notice symptoms of it–forgetting things–at age 47. What shocked me about the story is his young age. According to a USA Today article on his predicament, of the 5.1 million or so Americans struck by the disease, at least 200,000 people younger than 65 have been stricken with the early-onset form of Alzheimer’s. Proof that you never know when your life will start to fade away. Chief Johansen has handled it all in a very brave, classy way. He could have resigned abruptly and told no-one, or he could have remained on the job, hiding his predicament. Instead, he courageously wrote a note to the 2,000 Lexington residents he swore to protect and keep safe, telling them of his condition. He will continue in his job, taking more notes and using electronic reminders of appointments. And he still carries his gun. He says he will know when it is time to give up his badge. Very sad and VERY young at 49. My mother had it, but it did not start till her eighties, like Reagan. There is no treatment that is more than marginally effective despite any hype to the contrary. I hope he got second and third opinions. That just doesn’t seem right. He’s in my prayers nonetheless. Hang in there, Police Chief Spencer Johansen. America needs people like you. Familiar with the onset and devastating acceleration of this menacing affliction, alzheimers inflicted its devastation on my children’s beloved Hebrew tutor at age 50. Within two years she is totally incapacitated. Prayers go out to this brave officer, his family and community.